A revolution in winch design has brought the 4 speed winch to the market. Really simple to use and automatic in operation. Just like sliced bread did, these winches will change the market altogether in our humble opinion. We have brought a selection of Pontos winches into stock with an order already to fit a pair of Pontos Trimmer 52’s on to a Hallberg Rassy 42 Ketch as main sheet winches instead of going down the Electric winch route. The extra power will make sheeting in the genoa very easy. And other owners currently looking at changing halyard winches for the Pontos Compact winch we believe this is going to be the hot product of 2016. To find out more visit the relevant pages of our website or contact Guy in the Chandlery. 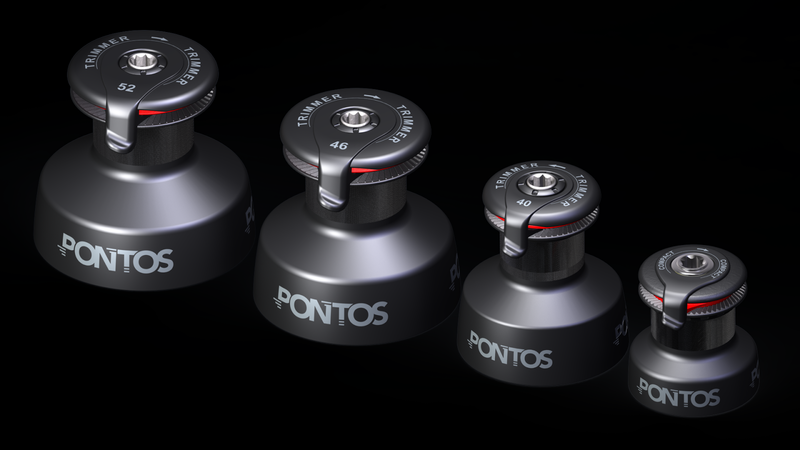 Pontos manufacture a 4-speed Grinder (and an automatic 4-speed Trimmer) for day sailing or racing, both designed to improve sail handling and reduce winching effort. The Grinder is an automatic 4 speed winch designed to sheet in “hands free” on all sheets, halyards and furling lines. The result is 700mm of line recovered in just one turn of the winch handle in first gear allowing faster tacking, hoisting and furling with the sheet fully wound into the self-tailer. The Automatic Trimmer has 2 additional gears which reduce winching effort and these automatically adjust from the line load. The result reduces winching effort by 50%. The Trimmer is 100% mechanical, more affordable than an electric winch and gives safety and comfort in any conditions. The mechanical advantage of a winch is calculated as a power ratio which compares the effort applied to the winch handle to the force that the winch exerts on the rope, in its lowest gear. With a Size 40 winch, a 10kg force applied to the handle will typically result in a 400kg pull on the rope. Power ratios have been used for some time to describe the size of winches, e.g. Size 28, Size 45, Size 52 etc., with physically larger winches generally having higher power ratios. However Pontos winches have now upset this convention, as the Pontos range packs far more pulling power than other winches of a similar physical size. With a Pontos Trimmer 40, the first two gears you use will be very similar to a conventional Size 40, but the Trimmer’s two additional gear ratios are much lower. A Pontos Trimmer 40, in its lowest gear, has an incredible power ratio of 112.9, giving a huge mechanical advantage for the size of the winch. With a Pontos Grinder 40, the lowest power ratio is more similar to conventional Size 40 winches from other manufacturers. The Grinder’s advantage lies in the additional two gears which aid fast line retrieval. Full details of the Pontos Winch range power specifications can be found on our website. The Pontos Compact, typically the same physical size as a conventional Size 28, provides the same pulling power as a conventional Size 45 in its lower gear ratio! The Compact is ideally suited to smaller boats, but could well be the solution when there is not enough room to fit a Grinder or Trimmer on some larger boats. Close attention should be paid to the likely working loads involved and professional advice sought about installation. We have a full Pontos Winch section on our website with technical details, downloadable specifications and current prices for each of the winches. You call also read what the press thought about these revolutionary new designs having completed testing at the end of last year.